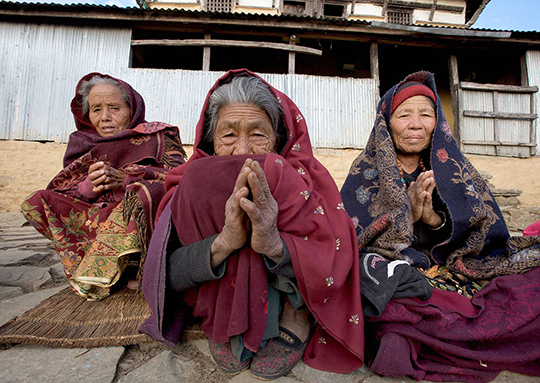 The 7.8-magnitude April 25 earthquake in Nepal has created a huge human tragedy. As of May 5, more than 7,500 people have died, over 14,500 have been injured, and 3.5 million people require food aid. "Nepal urgently needs around one million tents to provide shelter to the affected people as more than 300,000 buildings have collapsed during the earthquake," Deputy Prime Minister Prakash Man Singh was quoted as saying in The Hindu. Structural engineers, including some from the United States, are currently inspecting building damage and assigning colored tags based on their condition and habitability. Getting essential aid, including medical care, temporary housing, food and potable water, to those in need is a challenge. Other complications include health risks related to people living in crowded temporary shelters, communication challenges between various aid agencies, and delays in the transportation and distribution of needed goods and services. While the situation is beginning to improve near Kathmandu, CNN reports "Mountain villages are cut off from almost everything, landslides block the roads and no significant aid is on the way." Many remote mountain villages have had no aid or a visit from a government official more than a week after the earthquake where houses and stores were destroyed and livestock was buried. Potable drinking water is scarce and food even scarcer. Earthquake survivors are refugees in their own villages, living under tents or sleeping out in the open. As just one example, little information has come from the Gorkha area near the Tibetan border, a remote region with a population of 288,135 near Manaslu, the eighth highest mountain in the world. In a Guardian interview with Kempo Chimed Tsering, a religious leader and former minister, about the tragedy in the area, Tsering said, "There are still injured there who have not been treated. Whole villages are flattened. They need tents very badly." Eleven tons of international aid, including needed medicine, shelter and food, have piled up at the Kathmandu airport and at border crossings from India, but are not being efficiently dispersed. Bureaucracy is to blame, according to Jamie McGoldrick, the United Nations resident coordinator, who was quoted in an interview with The New York Times. "The bottleneck was the fact that the bureaucratic procedures were just so heavy. So many layers of government and so many departments involved, so many different line ministries involved. We don't need goods sitting in Kathmandu warehouses," McGoldrick was reported as saying. "We don't need goods sitting at the airport. We need them up in the affected areas." On Sunday, May 3, after approval from the Nepali government, the United States military arrived to help ferry supplies to remote villages. A huge C-17 transport plane landed at Kathmandu and a UH-17 helicopter was unloaded, while four Osprey tilt-rotor aircraft flew into Nepal from Okinawa, Japan. 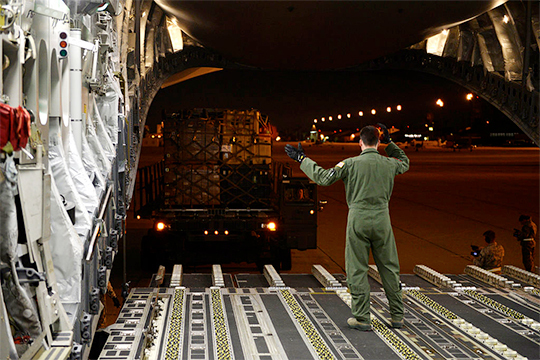 The helicopters will distribute aid supplies from Kathmandu to the otherwise-inaccessible rural villages. US Marine Brigadier General Paul Kennedy, heading the mission, told CBS News correspondent Seth Doane, "We're going to download these airplanes, and then get them out to the far reaches." He added that the Marines and the helicopters have the ability to fly to "austere environments very quickly, with capabilities that, I mean, we could build an airfield out of nothing... the international relief community doesn't do that." Many aid organizations from around the world as well as local Nepalis are also working to get goods to the sick and injured. As of 4:00 p.m. EST, May 5, Sherpa Adventure Gear, one of many organizations, has raised $81,627 through a crowdsourcing campaign started on April 28, to provide items including emergency food, tents and blankets for the Nepali people who lost their homes. The Sherpa Earthquake Relief fund will benefit the Paldorje Sherpa Foundation, with 100 percent of the donations going to immediate relief through the Paldorje Education Fund network. In a dispatch Sherpa Adventure Gear CEO Tashi Sherpa sent Alpinist on April 29, he wrote, "The biggest and most urgent need now seems to be shelters in the remote villages where everything has been flattened." 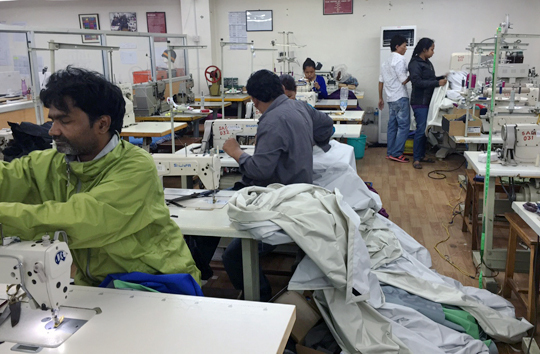 Sherpa Adventure Gear is currently sewing up around 400 simple waterproof tents and about 500 fleece blankets for distribution. Meanwhile, many of Sherpa Adventure's staff members have lost their homes and are living in tents. Tashi Sherpa continues, "We've set up emergency earthquake funds of $1,500 per family for housing relief and an increase in our compassionate funding of $1,000 for family bereavement rituals." Dawa Steven Sherpa, an Alpinist contributor in Kathmandu, has also been working all week on relief efforts. He wrote on Facebook last week, "We are acutely short of the basic supplies. As soon as we get anything, it's gone." He said that there are schools and orphanages begging for tarps for shelter and that "people are calling us saying they have nothing to eat anymore." The most essential necessities right now are shelter, food and medicine. Dawa Steven Sherpa said that he went to Ramkot VDC area for a field visit to assess damage and needs for local people. "The road to the area only opened yesterday after debris had to be cleared... it was scary to see that about 350 houses were demolished by the earthquake," he wrote. He also said that after five nights outdoors, he was now sleeping in his own bed: "I refuse to be afraid anymore."